The Primeros by Davidoff Escurio is an elegant and complex cigarillo, medium bodied 4 1/6”x 34 smoke using a mix of Brazilian and Dominican blend. This stogie, of Petit Panetela size, will deliver the perfect experience for a 15 minute break thanks to its carefully tailored mix of tobacco, slightly spicy but very rich in aromas. 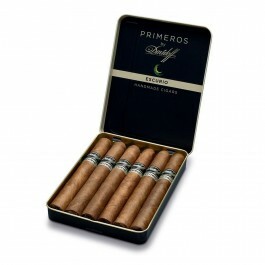 These cigars come in 5 metal tins of 6 cigars.